Hello everyone! Today, I want to show you my mini quilt for the Teal Mini Swap 2016 hosted by Beth at EvaPaige Quilt Designs for Ovarian Cancer Research. I’m also going to enter it in the mini category in the Bloggers Quilt Festival hosted by Amy of Amy’sCreativeSide. My swap partner, Melissa of Albuquerque, has received her quilt so I can show it to you now. Melissa is the Editor-in-chief of Generation Q Magazine. Check it out. She is participating in the swap for her friend Earlene. I wanted to participate to support Beth who is one of the Maggie’s First Dance BOM featured bloggers and because I think this is a good cause. Ovarian Cancer is still one of the hardest to detect and I hope that more research can help in this area. OK, on to the mini. The pattern is Flash Point from Make It Mini: Small Quilts and More 2016 from Better Homes and Gardens. This design is a mini makeover of Sharon Tucker’s “Black, White and Bright.” (Please forgive the exposure on this photo. I’ve tried to correct it, but haven’t been able too and the quilt is gone). The quilt is 16 1/2″ x 16 1/2″ and the block size is 6″. 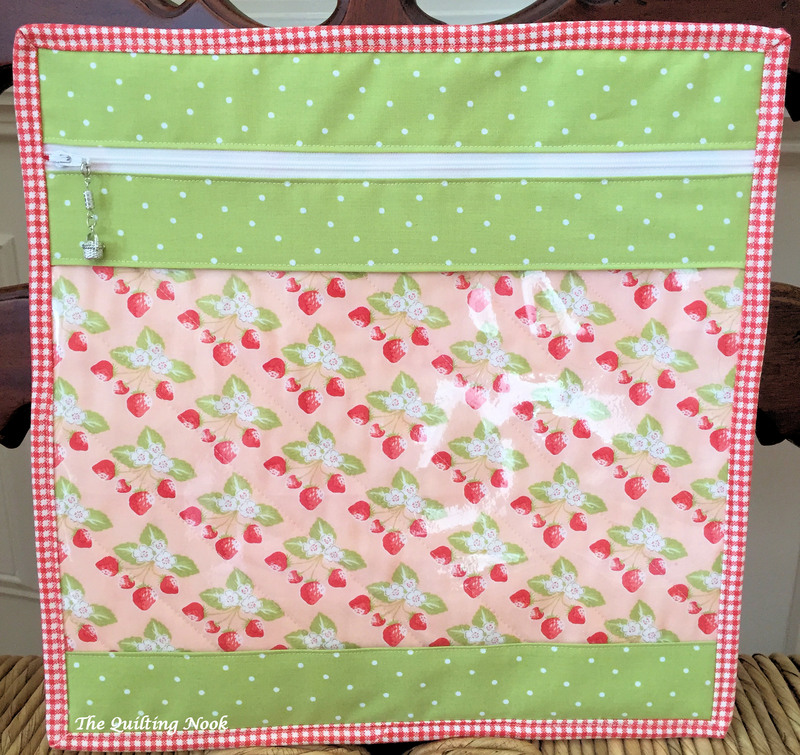 I deviated from the design by adding the 1/2″ inner border and making the outer border 1 1/2″. The circle fabric is the swap fabric provided by Moda. The blue teal is from Pat Sloan’s Hometown Girl, and the rest are from Sherri and Chelsi’s Valley and Bright Sun, all by Moda. I pieced and quilted this with Aurifil 50 wt cotton. The construction for this mini is different than what I have done before. You started with a wedge shape that made a circle. I used the teal swap fabric for the centers. To get the circles nice and round, I drew my circle onto some woven interfacing, then used my open toe foot to sew them together. I cut a hole in the center of the interfacing, turned, then had a nice round circle. Next, I hand appliqued with Aurifil 50 wt. One of the fun things about this pattern is that you can turn the blocks and get different designs. Here are a few things you can do with it. Melissa told me that she was making her mini in memory of her friend, Earlene, that lost her battle with Ovarian Cancer. Her friend didn’t quilt, but she did do embroidery. I wanted to include some in the quilt, so I decided to embroider on the label. Jenny of Elefantz provided me with the perfect design. It was part of August’s Stitchery Club, just in time for the quilt. All the floss is DMC except for the varigated flowers, which is a Sulky 12 wt. Next up, how was I going to quilt it? I stitched in the ditch around all the rays, then quilted graduating circles in the background. This was enough to make the rays pop. As you can see, I marked my circles with a purple disappearing pen. I thought is would make the rays stand out even more if I continued those lines into the border. I marked the extension of the lines, but then used my Westalee Ruler foot and ruler to quilt them. I always like how the back can really show off the quilting. Here is the back with the label. Melissa, I hope you enjoy the quilt. It was a lot of fun to make. To see more of the Mini Teal Swap quilts, visit Beth’s Facebook page. If you like my mini, you can vote for it here starting on September 25 in the mini category of the Bloggers Quilt Festival. Be sure to visit Amy for all the other wonderful quilts in the festival. Thanks for stopping by. PS What am I going to do with the leftovers? This entry was posted in applique, embroidery, FMQ, Free Motion Ruler Work, minis, Stitchery, Teal Mini Swap 2016, Uncategorized and tagged applique, embroidery, FMQ, free motion quilting, minis, Ruler Work on Domestic Machine, rulerfoot, Stitchery. Bookmark the permalink. The back is just as interesting as the front! Your scraps will turn into something quite nice too! Your seams match so perfectly. Wonderful attention to detail in this mini quit, and the back is beautiful, stunning label. Very pretty! How long did it take you? Thank you! The quilt probably took between 18-20 hours which included a couple of planning hours. I’m not a speedy sewer, especially with the FMQ. I like to take my time. The embroidery took about 7-8 hours. Brenda, I really enjoyed reading about how you created this work of art! thank you again. I am very proud to have this hanging on my wall.